P. T. Barnum? Britney Spears? George Herbert? Jane Russell? W. Clement Stone? Ralph Waldo Emerson? Norman Vincent Peale? Les Brown? John McEnroe? If I shoot at the sun, I may hit a star. If we aim at the moon—we may hit a star! Shoot for the moon. If you miss it, you will still land among the stars. The moon and sun are impressive objects in the sky while the stars are less luminous and therefore not as visually striking. Hence, I think that these adages mean the following: If you set a very difficult goal for yourself then even if you are only partially successful you will find that the result is still superb. If you don’t aim for the stars, you’re not going to get to the moon. I’ll shoot for the stars, and I’ll settle for the moon. These types of sayings have been credited to P. T. Barnum, Norman Vincent Peale, and others. 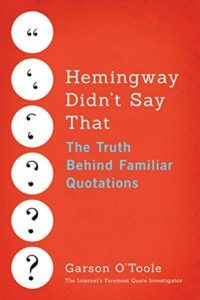 Could you examine this class of quotations? Shoots higher much, than he that means a tree. Cures both a Fever, and Lethargickness. …still George Herbert’s advice on a higher matter is applicable to this, that we had better shoot at the moon if we want to hit a high mark. You remember the old saying, Beatrice, “Shoot at the moon and you will hit the top of the highest tree.” If you could not be a genius you may, nevertheless, have made greater progress by the effort to be one. Probably the ingenious author goes on the principle that if you shoot at the stars you may hit a tree. If you cram your novel with Cabinet Ministers and Latin and Greek and Lafitte, you may get the public to listen to your substantial but prosaic grievance, that an inmate of Whitecross Street prison may not receive visitors on a Sunday. Again, he would say, “shoot an arrow at the sun every morning.” “But we can’t hit it,” was the answer. “You will hit higher than if you aimed lower,” he would reply. It helps either man or woman to have a noble model and to aim to accomplish noble deeds similar to those of his, or her chosen model. It is better to shoot at the sun than to grovel in the dirt. Our first requisite is that we have some definite purpose to which we shall give our life. And I plead with you to let that purpose be high. “Aim high,” writes Emerson, “and you may hit a star.” Regard, therefore, the work to which you give your life as worthy of your effort. “Home,” is where the mortgage is. “Aim at a chorus girl,” and you may hit a star. If I shoot at the moon I might hit the top of a haystack, so that if I try after the perfection of these counsels I might at least attain to a pretty good state of medical, milking, and sanitary efficiency. Have you ever heard that eating the crust of bread will make the hair curl? Well, maybe it will and maybe it won’t. You will be the better for trying. When you reach for the stars but only land on the moon, you’re somewhat disappointed. Oklahoma City’s Purple Power fast pitch softball team, however, would tell you a lunar landing isn’t all that bad. “To use a space term, if you don’t aim for the stars, you’re not going to get to the moon,” said Jim Benedict, president of J.H. Benedict and Associates Advertising, which has offices in Cocoa Beach and Daytona Beach. I think the sky’s the limit. I’ll shoot for the moon, I’ll shoot for the stars, and I’ll settle for the moon and I’ll give it a hell of a try. If you shoot (aim) for the stars, maybe at least you will hit the moon (get over the trees, etc.). In conclusion, this class of sayings has a long history and there are many different variations based on permutations of astronomical objects and trees. QI believes that the 1633 verse of George Herbert was an important aboriginal source. The first instance known to QI of “If I shoot at the sun, I may hit a star” was ascribed to P. T Barnum. But QI was unable to find direct evidence, i.e., a book by Barnum or an interview containing the statement. Over the years multiple prominent people have used expressions from within this popular class of adages.